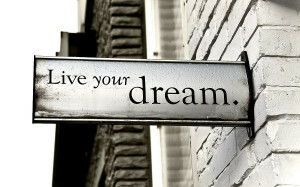 Isn't it funny how difficult it is to stay motivated to accomplish your dreams and life goals? By definition something that is a dream or goal you have in life is something that should create a desire in you so strong that it eats at you until you have the ability to satisfy it, but for some reason, we can't seem to stay motivated, we can't remember why its so important to us to keep our vision, to keep our aim. In order to maintain motivation to accomplish what really is your DREAM, the first step is believing in yourself, the second is having a reason for it being your dream, and the third is creating an actionable plan. What successful people understand that the rest of us seem to forget or maybe never knew in the first place is so simple its mind blowing: All you need to do to accomplish your dreams is to have a dream, and then go out and do what is necessary for it to be realized. It sounds ridiculous, but really, what is holding you back from all of your dreams being realized besides the fact that you don't do what is necessary for them to come to fruition? Believe in yourself, you can do anything you put your mind to, don't listen to the negativity your mind spits out, you are capable of absolutely anything and all you need to do is first of all believe it, and second of all make it happen one step at a time. (2) Write on a piece of paper why your dream is in fact your dream, what is the reason that this accomplishment is a DREAM of yours as opposed to some passing desire. This reason, this WHY should be the first thing you think of in the morning, it should be the background of your phone and computer screen, it should be the last thing you think about before sleeping, it should be on your mind and in your heart at all hours of the day, it should be what creates passion in you, and you should make sure you're being constantly reminded of exactly WHY you want and need to accomplish this goal. You want to write WHY it is a dream of yours, and every single benefit that you will receive for the rest of your life if this dream of yours is accomplished, exactly how your life will benefit from achieving this goal. (2) Outline every single step that has to be taken in order to accomplish this dream of yours. The great wall of china started with one brick. I'd just like to expand on that a little bit and say that by outlining exactly what brick you're going to put up in what order, and in what place, creates a situation where you no longer have to define and think about what steps are necessary to inch towards your goal but rather you just need to take the action. Outlining every step that's necessary takes a huge burden off you, and all you have to do from that point is act. When you look at the end goal and think about everything that you need to do to get there you have this daunting feeling, you feel that you might not be able to do it, you think there's too much work to be done so why start in the first place, you aren't sure what the first step you need to take is, or maybe you do but you're just scared of the amount of work you know its going to take. What creating an outline of every step necessary to take does, is that you create mini goals for yourself that will dramatically increase the likelihood of actually completing those goals. You have a big goal, yeah, of course. But all you have to do today is step 1, and taking one step is a lot easier than running a 26 mile marathon. Create definable bench marks while always maintaining the end goal in mind. Once I had this closet my mom as begging me to clean out when I was 15 so we could donate my old clothes. I refused to do it cause I knew it was going to take FOREVER. One day my mom gave me an idea and asked me to just take 5 articles of clothing out of that closet every day. In a month I was done with the whole thing and it took less than a minute a day to complete. Simple story, huge implications for my life. One step at a time, one day at a time, definable goals, believe and love for yourself, and all of your dreams will come true.